We both awoke early and wanted to visit the souvenir shop we’d been seeing advertisements for since the last 900 miles. Here It Is! The Jack Rabbit Trading Post—a tchotchke shop with item after item of its iconic rabbit silhouette. They were out of their cherry drink, which you still can not imbibe there today, but at one time they were famous for. I must’ve snatched up over $100 worth of the black bunny, in addition to a flat of bottled water—Kyle and I were getting ready to head into the Mojave. We were on a mission to get to the Grand Canyon by noon, and after creeping up Route 180 to AZ Route 64, and passing signs for “Nice Indians” selling “genuine Indian Goods,” we saw inner workings of our world. 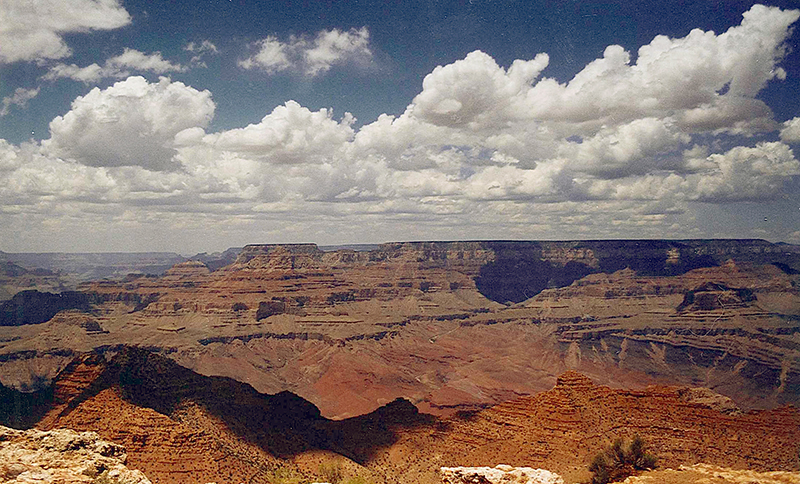 The Grand Canyon is not a place that one can describe—it shouldn’t be described. It’s somewhere every American should go. 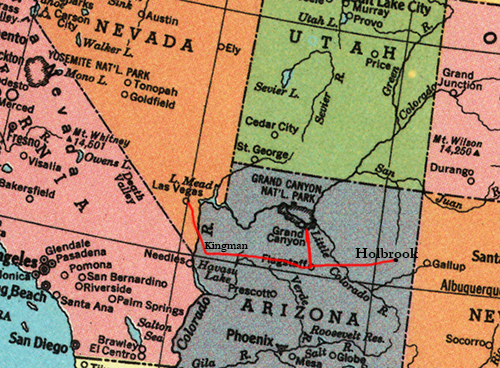 Kyle and I drove back down to Flagstaff and then took Route 66 to Kingman, Arizona. The sun was setting and we debated on whether to bunk down in the last large city before L.A., or to truck on and hit Needles, California. While I was eating a cheeseburger in an oddly quiet Denny’s, Kyle suggested we drive to Las Vegas. While the sun glowed just below the Rocky Mountain horizon, we drove to Hoover Dam, and on to Vegas. We arrived at 1:00 a.m., but didn’t go to bed until 7:00 a.m. Kyle and I met for breakfast in a steakhouse, and for once both of us agreed—this place was too much. But we didn’t want to leave yet. 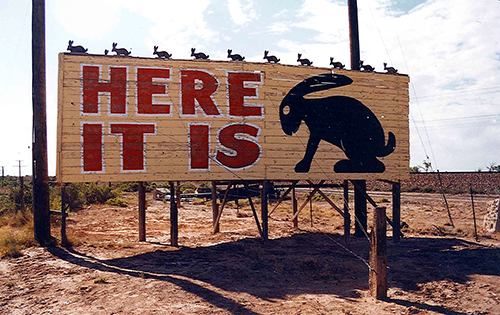 The Jack Rabbit Trading Post in 2001—the place still beat with the original 1949 souvenir shop heart. Today rumors abound that it’s just a regular Stop-n-Go minimart. I’m going to have to go there soon to find out. July 19, 2001. The Grand Canyon from the South Rim. July 19, 2001. 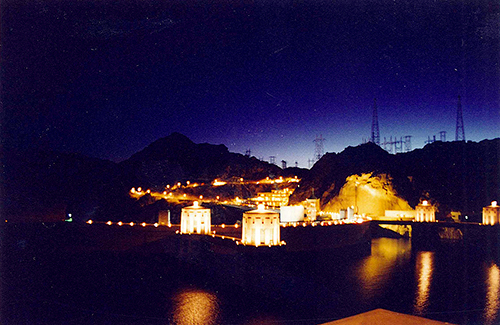 The Hoover Dam lit up in its Art Deco glory is reminiscent of a Mediaeval kingdom. July 19, 2001. 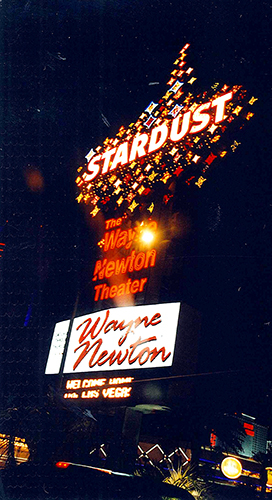 The Stardust Motel in Las Vegas. Opened in 1958. Imploded in 2007. On our visit there was much left of the original Vegas. Today it is a shopping mall with slot machines, poker tables, and whores. July 19, 2001.